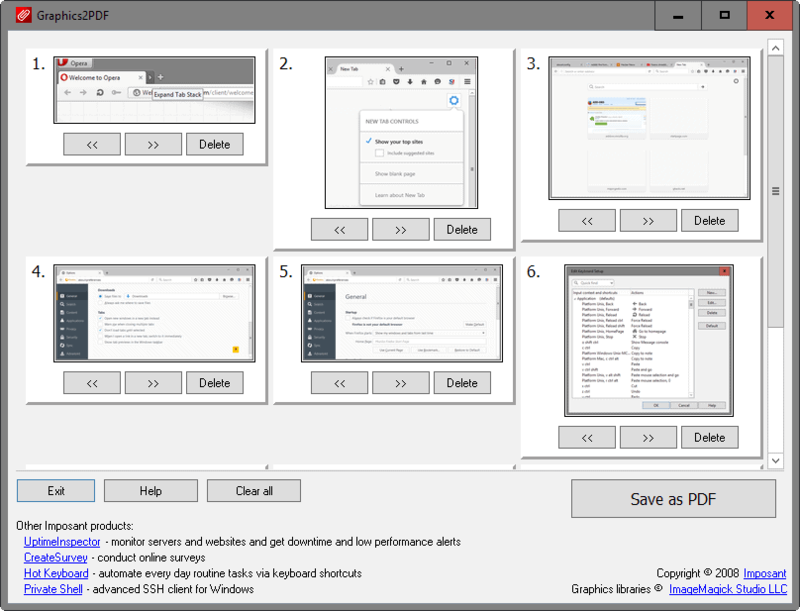 Graphics2PDF is a free image to PDF converter software program for Windows that can turn a set of photos and images into a PDF document. There are several applications for the program, for instance to improve the manageability of a batch of photos or images, to make the whole thing look more professional, or to send photos taken during a meeting to everyone involved in a single file. It can also be used to combine a series of pictures, a comic strip for instance that you have downloaded from the Internet, and to hide pictures from prying eyes. Who would think that a pdf entitled C++ in 24h would in reality contain a set of photos? The pdf converter Graphics2PDF can convert selected bmp, jpg, gif, png and tiff images into one or several pdf documents. The interface of the software application is straightforward and without bells and whistles. You drag and drop images from the underlying software to the program interface to add them to the queue. All images added this way are displayed as thumbnails in the interface. You may change the order in which they appear in the PDF document by using the left or right buttons displayed underneath each image. A click on Save PDF converts the images to a pdf document that is fully compatible with Adobe Reader and other PDF readers. The pdf converter misses a few parameters that would increase its usefulness like options to encrypt the pdf document and to add other elements like text, copyright information or links to it. No word on compatibility on the software developer's homepage. The version ran fine on a Windows XP Service Pack 3 test system. Update: The program has not been updated by its author ever since its initial released back in 2008. We have tested the program under Windows 7, 8 and 10 and it installs and works fine under those operating systems. Please note that you may need to run the installer with elevated rights as the installation may otherwise stop due to write errors. The lack of updates on the other hand means that the feature set the program ships with is the same as in 2008. This is not as much a problem as it sounds as there have not been any major changes in image formats or changes to the PDF format to render the converter less useful than before. At your age, it isn’t appropriate to watch ‘such’ photos!